Experts from the UK’s leading leasing companies will be on hand to advise Fleet Live delegates on the wide range of issues facing fleet operators. The introduction of WLTP emissions testing and clean air zones, as well as the diesel versus petrol versus alternatively fuelled vehicle debate are high on the agenda, according to Richard Dainty, fleet marketing manager, Daimler Fleet Management. He adds that Fleet Live will be a good opportunity for fleets to discuss, “future-proofing car/travel policies and the introduction of new mobility products”. TCH Leasing will promote its new outsourcing department at Fleet Live, showcasing the wide range of services the company can offer customers, liberating employees to concentrate on their core business. “You can outsource driving licence checks, MID updates, issuing and renewing fuels cards, MOT and service reminders, travel abroad documentation, manufacturer recalls, mileage captures, cherished registration transfer, parking fines and speeding tickets,” said Ranjit Grewal, head of business development, TCH Leasing. With the weakness of sterling inflating new car prices during the Brexit negotiations and driving up the cost of leasing by as much as 9% over the past year, according to accountants UHY Hacker, Fleet Live offers a convenient opportunity for fleet managers and procurement staff to meet alternative suppliers and discuss solutions to keep costs in check. Some of these solutions challenge the very concept of one driver/one vehicle, and even the idea of maintaining a fixed fleet. Arval Car Sharing, for example, offers an alternative to a pool fleet, giving companies access to vehicles when they need them, but also taking advantage of revenue generating opportunities to hire those cars out to employees in the evenings and at weekends. The service is due to launch in the second half of this year. Leasing giant LeasePlan sees a growing number of customers wanting complete flexibility in their transport. “Our customers – whether they are corporate, SMEs or private individuals – would prefer a ‘Car-as-a-Service’ with no strings attached in terms of car type or duration. They just want ‘any car, any time, anywhere’,” said Tex Gunning, LeasePlan CEO. Alphabet has been one of the earliest advocates of mobility solutions, from its car sharing service AlphaCity, to its zero emission solution, AlphaElectric. AlphaFlex goes even farther, empowering customers to manage a mobility budget, rather than a car allowance, to cover their travel costs, whether by public transport, cycling or taxi services. Key to all these products is the analysis of individual fleet requirements prior to implementation. Conversations at Fleet Live can start the ball rolling. New technology is having a radical impact on fleet management services, with connected vehicles delivering valuable information second-by-second to fleet operators, while drivers increasingly depend on apps to access fleet services. Telematics services that were once used simply to locate vehicles, and more recently to track how they are being driven, are now accessing data directly from engine management systems. This not only enables fleet operators to monitor odometer readings, but is also facilitating the early identification of faults, reducing the risk of breakdowns and allowing for scheduled maintenance appointments. Specialist fleet management companies are at the vanguard of these developments, helping fleet managers to make sense of the torrent of data heading their way, often from different and incompatible sources. By managing supply chains, pre-approving work and auditing invoices, fleet management companies can help fleets maximise vehicle uptime and minimise the cost of SMR, while ensuring all vehicles comply with all relevant regulations. 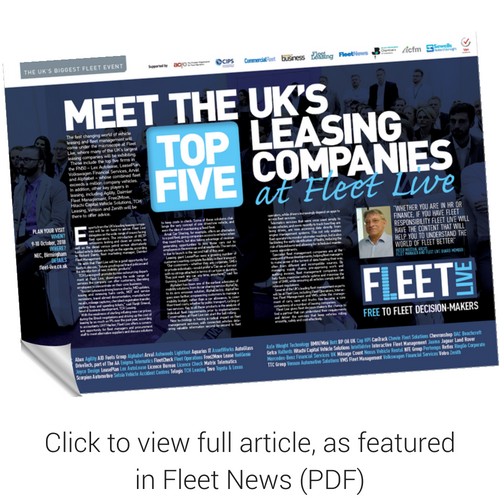 Several of the UK’s leading fleet management experts will be at Fleet Live, including Fleet Operations, Interactive Fleet Management and VMS, while the management of cars, vans and trucks has become a core competency of a number of leasing companies.